The Survival Kit Guide - Page 2 of 2 - Survival Gear Reviews and Tips, Disaster Preparedness Resources, Survival Skills, Bushcraft Ideas, and more!The Survival Kit Guide | Survival Gear Reviews and Tips, Disaster Preparedness Resources, Survival Skills, Bushcraft Ideas, and more! | Page 2	The Survival Kit Guide - Page 2 of 2 - Survival Gear Reviews and Tips, Disaster Preparedness Resources, Survival Skills, Bushcraft Ideas, and more! Certainly one important piece of gear that should be included in any degree of bug out bag is illumination, ie a flashlight. Whether your bag is meant for short term emergencies, a three day survival bag or a long term bug out bag, a quality flashlight is crucial. 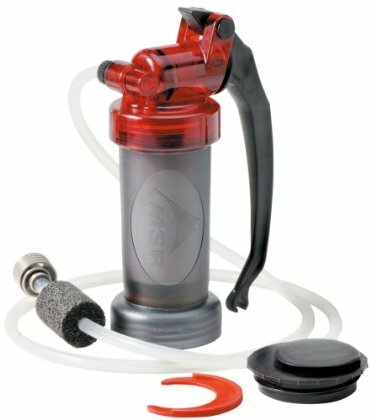 The MSR Mini [$72.92 via Amazon] is very simple to use and has a good output-per-pump ratio. More importantly, the water tastes CLEAN and nobody gets sick. Also, it requires no chemical additives but still claims to filter everything but viruses. The chance of contracting a waterborne virus from a U.S. lake or stream (think Polio, Hep-A, SARS, and a few others which you have probably had vaccinations for) is far lower than getting sick from bacteria or parasites. If this still bothers you, you can still boil your clear, clean-tasting water just to be sure. The maintenance on this filter is very simple. The unit breaks down into 4 major parts, and the wrist pins on the pump assembly are quick-release squeeze-and-push types. You can literally have this thing stripped down and cleaned completely in about 5 minutes, and that includes the sterilization of the filter element. A couple dabs of silicone grease or even chap-stick is all you need to lube it up when you are reassembling the unit. 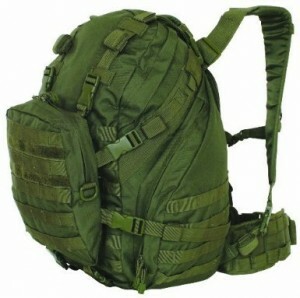 It’s a great filter that I have used on many hiking trips. It pumps fast and is very handy. At 16 oz. it is not the lightest filter on the market but its design makes it very field maintainable. The only down side that I could find with the product was that the filter is somewhat delicate. 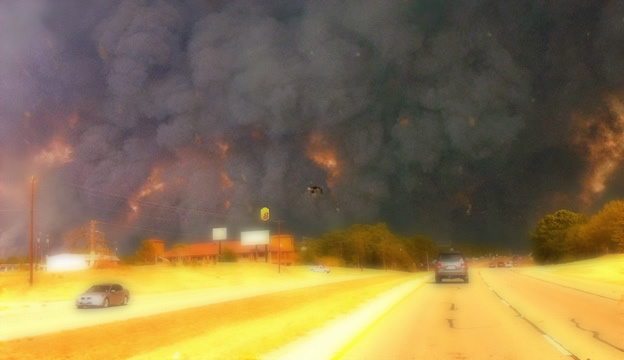 This could pose a threat if you didn’t have available replacements in a survival situation. Pliers: The cutters are extremely solid. 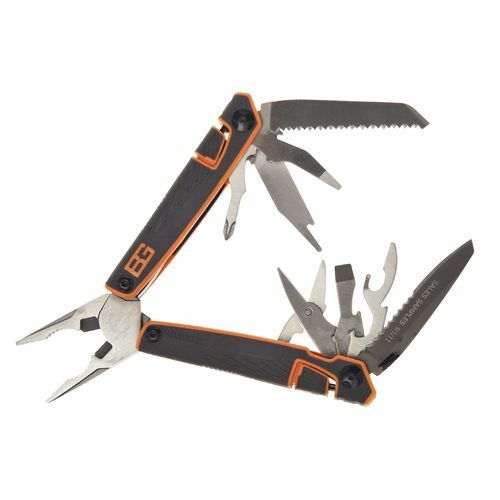 Whether you are stripping a wire or cranking down a loose nut it’s one of the most used items on this multi-tool. They are spring loaded and come pre-sharpened. Wood Saw: The saw has a really aggressive profile. This seems to be the only tool that is as big as possible, and it needs to be. With a little elbow grease you can cut up some pretty sizable pieces of wood. File: What can I say…. It’s a file. On any prolonged stay in the wilderness one can offer up some of the finest manicure/pedicures on this side of Patagonia. Serrated Blade: It can be useful when cutting through tendon on the hind quarters of a deer but you lose a little blade length because of it. It’s sharp out of the box and works well with the flint stick. Small Flat Head: I use it on a daily basis. It is standard but I couldn’t get by without it. Medium Flat Head: Although it is much less standard to include two sizes, I’m glad Gerber did. When it comes to standard hardware you are much more likely to find a larger slot than a smaller. Pierce: This was very well designed. I was able to dispatch a can of its lid quickly to empty my mornings bacon grease with zero potentially dangerous slips. Bottle Opener: I’m not sure of the validity of including this tool in modern society. I really have only used it to open my adult beverages. 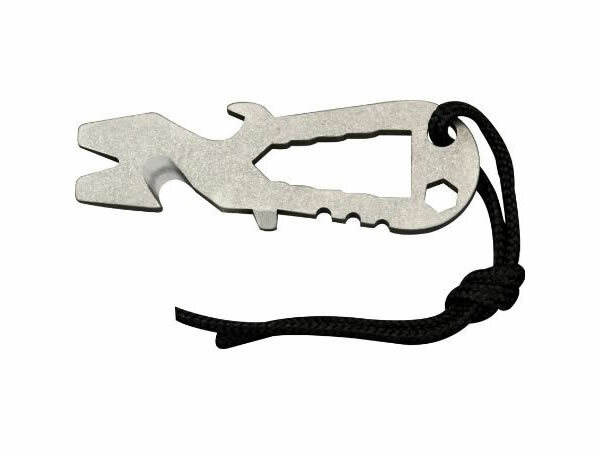 I don’t mind the inclusion on your everyday multi tool, but this is a SURVIVAL tool and I feel they could have come up with something more useful (gut hook or punch tool). Philips Head: If you want to be picky it could be a size or two larger. (So you don’t strip screws) In all reality I use it either when I’m too lazy to get a real phillips head out of the tool box or if I just don’t have one on me. It saved me several months ago when my radiator hose blew off and all I needed was a phillips head to tighten down the hose clamp. The Schrade Ti Tool ($22.38 on Amazon) is a sweet little multi-tool for your keychain.. Sure, you’ll mostly use it to open beer bottles, but you never know when its other features could save the day. The aerospace-grade titanium construction means its stronger than steel and so light that you will barely know its in your pocket. The seatbelt cutter is great for cutting rope, wires, paracord, etc.. and its designed so that you wont accidently cut yourself on its super-sharp blade. The Kershaw Scallion ($39.57) is a small, well-built stainless steel pocket knife that makes a great every-day carry. A good friend of mine gave me this knife as a gift a couple of years ago and I have carried it with me on a daily basis ever since. Its even got my nickname laser engraved on it (thanks Cummings)! Its easy to open with a flick of the thumb.. pretty cool when you need to use it quickly. The combo serrated/traditional blade makes it versatile for various tasks. The build-quality is obviously top-notch…it feels awesome in your hand – like a tool that will probably last a lifetime. The built-in clip is sturdy and perfect for attaching to your pants pocket.. 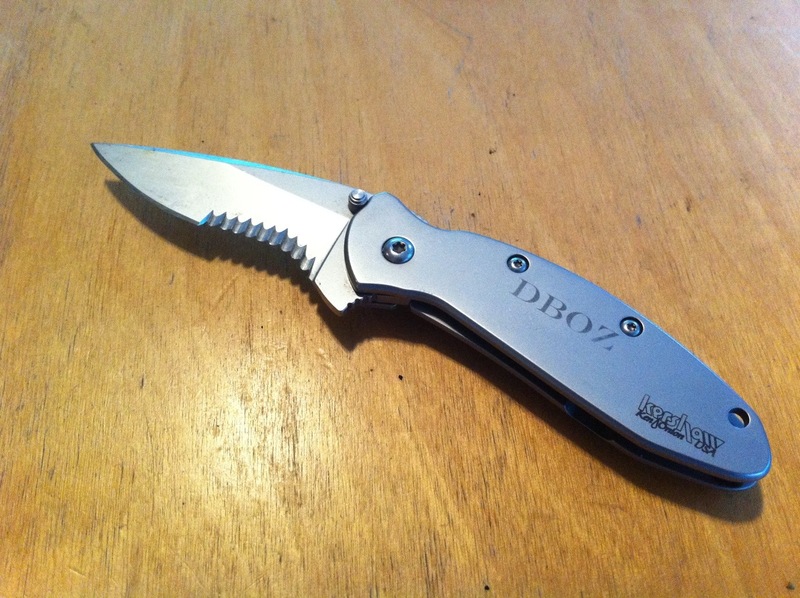 The low-profile design makes it a perfect pocket knife.. its there when you need it otherwise you dont really feel like its weighing you down. DO NOT LEAVE YOUR PETS BEHIND! 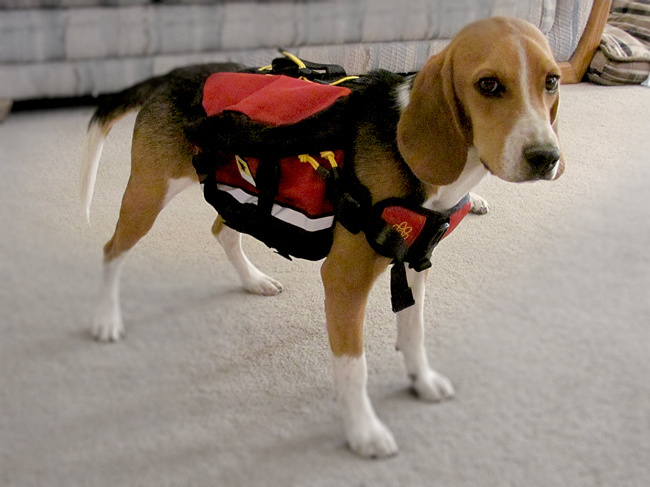 With just a little bit of planning and preparation, you’ll can be ready to evacuate your home AND take your furry friends along in the event of a disaster. Here’s our list of essential items to stock for your dog or cat. Pack and store these items together in a secure, dry area like your garage. When disaster strikes you can just grab the crate, the pets and bug out! We’ve also taken the time to recommend some quality products for most list items.